The "US consumer and credit creation" were pretty intertwined I'd say. So how are we faring in our pursuit of a new business model? 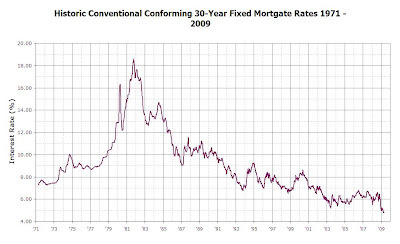 We've (artificially) gotten mortgage rates down to their lowest levels EVER, with Uncle Sam even pitching in for the down payment. Sounds like a reckless consumer + more credit creation to me. Seriously - some of the world's most reliable AAA-rated companies would LOVE to borrow at 4.5% (granted some do, but not on 30-year debt)- instead the taxpayer subsidizes that rate for your neighbor Chuck who fibbed about his income.